Today I was reminded, once again, of a brief but torrid love affair that I had about 7 years ago. Even though time has passed I still remember it as if it were yesterday and long for the happiness that that love affair brought to my life at a time when I was lonely and feeling vulnerable. Today that love affair might be rekindled. To make this story even more interesting let me just tell you that it occurred in a church. Yep—a United Methodist Church to be exact. Epworth United Methodist Church to be precise. At the time I had an amazing job. Possibly it was the job with the longest job title in the world—Director of Small Groups and Servant Ministries. What did that mean? Well—it meant I got to do what I had done for years for free but now I got paid for it. It was perhaps THE perfect job for me and I was so blessed to have had the fabulous Rev. Dr. Mark Ralls as my boss, mentor and friend during my tenure in this position. One of the areas that we were trying to expand was our outreach into the community by offering a new worship experience that might attract those who had not visited our church before. Before long a fabulously gifted music leader was hired, a new name of Jacob’s Well was chosen, Fellowship Hall was repainted and a new worship experience was born. It was a more casual service and coffee and snacks were a part of the package that we were offering. Enter the object of my affection. The Flavia Coffee Brewing System. Oh—the memories almost make me quiver. It was funded by an angel investor who wanted to support our efforts to provide a great experience to all who entered those doors and I will be forever grateful to this angel because those funds allowed us to obtain a rental machine that produced possibly the most wonderful combination of brews for our folks. Coffees, lattes, tea, hot chocolate—-it was all there. Oh—it was heaven ….while it lasted. Today my love affair might just be rekindled. My husband is doing some work away from home and the corporate complex that he is staying in offers some fabulous views of the city and other wonderful amenities. As I visited him in his current home away from home he gave me the nickel tour of the place so that I can get around while he slaves away. In the lobby area is a little snack nook complete with—you guessed it—–a FLAVIA machine!!! My eyes bugged out! Oh it may not look like much to the untrained eye but to those who have loved and lost it is enough to put said person over the edge. I am pacing myself. I don’t want to appear too needy or demanding in case the Repo Man is around…..stay tuned . What a great selection of drinks! A lovely cup of tea awaits!!!!! Have you ever had a torrid love affair that you are willing to confess ? Tell me all about it in your comments! If you want to see a fun YouTube video that someone made to show the magical Flavia machine click on the video below. I can understand your love affair. I have a crush on my viking coffee machine. This baby brews the best pot! Holly was a baby then—that was right after we moved to Iowa and had gotten the kitties—-she was probably 3-4 months old in that pic. I forgot how little she was. Those are nice–we have those where I work too–I think each floor has one. That job really does sound perfect for you! Your work place must rock!!! And obviously you have more users than we had! 🙂 Yep—it really was the perfect job for me—-I miss it ..somedays! You are funny. It is destiny that you meet again! It was funny when I was trying to find a picture of my old Flavia machine and found that one. 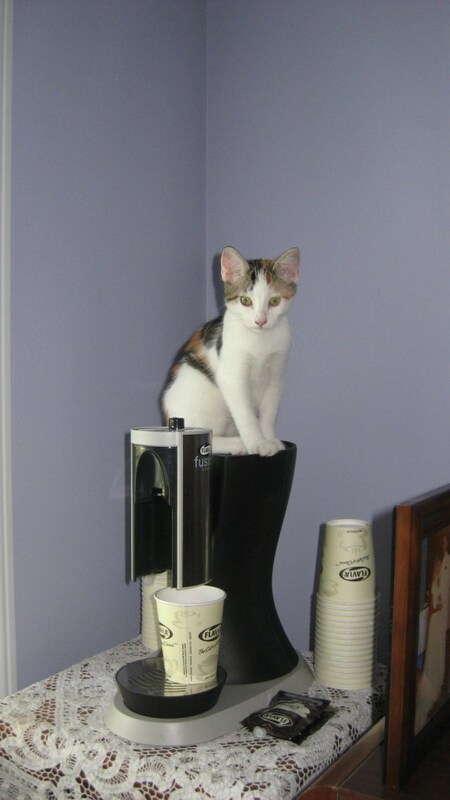 I knew I had taken one and there it was—with baby Holly atop it. She was so tiny!!! I do love that machine, though! Fantastic humorous storytelling, Beth Ann. You should contact the communications people at Flavia and direct them to this post. I am serious. This is one fine fine piece of writing. Thanks, Audrey! 🙂 Got you fooled with that title, huh? Thanks for the encouragement. It was too good of a story to not tell! Glad you contacted Flavia. And you’re right, too good of a story not to tell. I love my Keurig too but they sometimes have their issues. Customer service there is pretty good usually, though. And the kitty is nowhere near that size. She has morphed into a larger version——-she has hit the menopausal weight gain like her owner. You get it, don’t you? You totally get it! There is just something that I love about that machine! I am not sure I have had any love affair but my husband. Card making may be the closest I have come to a love affair. Steamy affair..Fabulous Pot and a sleek machine pouring out hot rich dark caffeine into your favorite mug. MMMM. I’m so sorry your love was so rudely torn from your lips; you have been so brave to perk up and move forward. When your eyes met a second time in the hotel lobby did you still feel the same lust, and did he light up in excitement? Or were you all the wiser and more nonchalant this time, planning to enjoy a couple quickies without real attachment? It is a pretty neat machine—let me tell you. The “personal” one I had at home was pretty good but did not quite measure up to the one in the offices. I love anything chocolate-raspberry so I think your daily splurge would be a favorite for me, too!!! Yum. Wow, that video! OMG! Really amateur hour. The machine reminds me of my Keurig coffee machine which I cannot do without at all. I think I would go through withdrawal without my Keurig coffee in the morning. This morning I’m having Vanilla Biscotti coffee! Since I only drink 1 cup of coffee a day, the Keurig is perfect for me. Brewing a pot would be a waste for me.